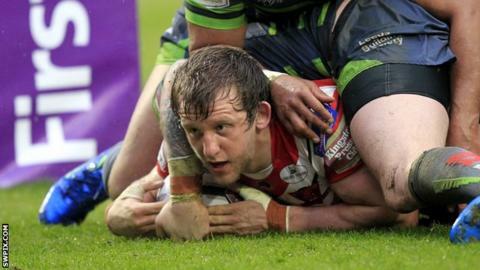 Salford Red Devils hung on to consign Leeds Rhinos to an eighth defeat in 10 Super League games this season. It left the struggling champions second bottom of the table, while Salford move into seventh place. The home side led 14-0 with converted tries from Logan Tomkins and Robert Lui, supplemented by a Michael Dobson penalty goal with seven minutes to go. However, late scores by Keith Galloway and Ashton Golding for the Rhinos set up a nervy finale. It looked for much of the game as though Leeds would run out point-less for the first time since September 1998, but their late tries gave the game a scoreline that belied the home side's dominance. While the focus will undoubtedly centre on lacklustre Leeds, and their inability to find form in 2016, Salford deserved immense credit for their suffocating defence and hard-running. Leeds had field position and possession, but failed to capitalise despite the presence of key personnel such as playmaker Danny McGuire and Zak Hardaker - last season's Man of Steel. Ian Watson's Red Devils weathered big pressure to go ahead when Tomkins scooted in for the opening try, backed up shortly after with Dobson's penalty goal for an 8-0 half-way lead. Half-back Lui added the second try of the game when he dummied through soft cover early in the second half. Leeds poured forward in desperation, and had tries chalked off before Galloway battered his way across to give Brian McDermott's side a chink of light. Golding's score ramped up the tension, but Hardaker missed the conversion and time ticked down as Salford clung to the points. Salford: O'Brien; Carney, Sau, J. Griffin, Evalds; Lui, Dobson; Kopczak, Tomkins, G. Griffin, Murdoch, Jones, Flanagan. Replacements: Wood, A. Walne, Krasniqi, J. Walne. Leeds: Hardaker; Golding, Watkins, Sutcliffe, Handley; McGuire, Burrow; Singleton, Falloon, Garbutt, Achurch, Ablett, Jones-Buchanan. Replacements: Galloway, Mullally, Baldwinson, Lilley.